Spend any time at all with Jamie Grace, and it’s obvious that she’s special. Her infectious smile, bright eyes and her expressive way with words are all tale-tell signs: this is one unique girl. But the effervescent spirit in this young woman is even more powerful and compelling than what can be seen. Her contagious joy and message of hope can only be understood in the context of her story. Hailing from Atlanta, Georgia, Jamie Grace learned two powerful lessons: one, that ministry is a way of life; two, that life is good, even when it’s hard. Diagnosed with Tourette Syndrome at age 11, her young life became a series of heartbreak and challenge, a long season of physical exhaustion, emotional stress and spiritual doubt. Fast-forward just three short years, and that decision is already bearing beautiful fruit, proving (again) that nothing is impossible with God. Today, at 19, Jamie Grace is a junior in college (yes, that’s right; she finished high school early), studying children’s ministry. She is sharing her story of resilience and hope in GraceTalk, a monthly mentoring group for young girls she started when she was 15, on JCTV’s “iShine KNECT,” and is now a featured speaker/performer on the 2011 Revolve Tour. “These songs are my heart songs,” she says, “straight off the pages of my diary. Very simple, very chill, but very fun. It’s what I think about, and what gets me through.” One listen to “One Song at a Time,” featuring GabeReal of DiverseCity, and you’ll see why. May we all have the courage to overcome our challenges and live out our purpose, like Jamie Grace. I hope you enjoyed your visit here today! Wow! Just today they played a song by Jamie Grace at the end of service and I asked who she was. Now I come to your blog and learn all about her. Thanks, Karen, for this post. 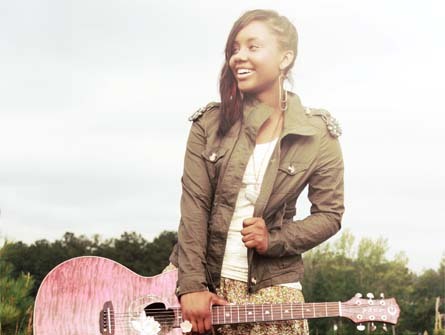 Jamie Grace is an inspiration to us all! Thanks so much for posting this article on Jamie Grace! She is such a wonderful inspiration for our younger kids today. I also enjoyed your Buliding 429 one as well! I LOVE your site and look forward to checking it often for new posts from you. It is very uplifting in a sometimes dire world that we live in. Keep up the great work and many blessing to you Karen!! Thanks so much, ladies! Ms. Jamie certainly is an inspiration. I love sharing stories like hers, in hopes that it will give folks who are struggling HOPE that their tomorrow can be different. I'll keep diggin' and churnin' 'em out! :-) Thanks for stopping by.